The Columbus Memorial Library (CML) is the institutional memory of the Organization of American States (OAS) and the Inter-American System. Its holdings include the official documentation of Specialized Conferences and Meetings, as well as the publications of the Specialized Organs of the OAS. The Library was created in 1890 with contributions from the hemisphere's governments including “historical, geographical, and literary works, maps, manuscripts, and official documents relating to the history and civilization of America." Commemorative Bookplate of the First International American Conference, 1889-1890. 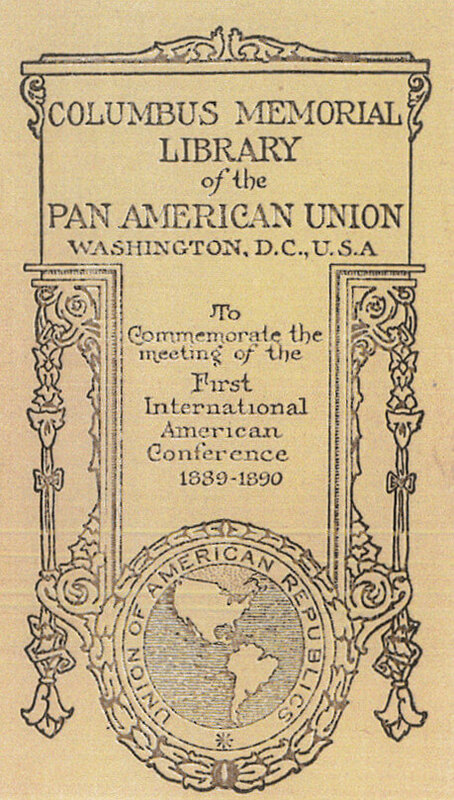 The First International Conference of American States, held in Washington, D.C. in 1889-1890, agreed, in the words of the Delegate from Colombia, Ambassador Carlos Martinez Silva, to establish "... a memorial Library, to which each government could send, on its own account, the most complete collection possible of historical, literary, and geographical works, laws, official reports, maps, etc., so that the results of intellectual and scientific labor in all America might be collected together under a single roof... That would be a monument more lasting and more noble than any in bronze or marble..."
The formal establishment of the Library occurred on 24 January 1902, when the Second International American Conference, meeting in Mexico, named the library the "Columbus Memorial Library". The Third International American Conference in Rio de Janeiro in 1906 expressed "gratification that the project to establish a permanent center of information and of interchange of ideas among the Republics of this Continent, as well as the erection of a building suitable for the Library in memory of Columbus, has been realized... "
This permanent center of information was located in the Pan American Union Building, constructed through the largesse of Mr. Andrew Carnegie. The Columbus Memorial Library prospered and grew in this location until the size of the collections far exceeded the space available for housing them in the Building. In 1982 the Librarian recommended that the collections and staff of the CML be relocated to the Administrative Services Building. The Library inaugurated services in its new quarters on 15 January l988. Today the Columbus Memorial Library falls under the auspices of the Secretariat for Hemispheric Affairs of the General Secretariat of the OAS and continues the mandates of the farsighted delegates to the First International Conference of American States. The collections of the Columbus Memorial Library contain books, periodicals, documents, archives and manuscripts, microforms, photographs, and other graphic and audiovisual materials on the Western Hemisphere. Many of these materials are rare and unique. Research services are provided to the Permanent Missions to the OAS, officials of the OAS, the General Secretariat and to the public. The Organization of American States distributes each year free of charge informational and technical publications of the General Secretariat and the Official Records of the OAS to selected institutions. To ensure their availability the Library maintains a network of depository libraries throughout the Americas and Europe. Designation as a depository library necessitates a formal agreement with the Columbus Memorial Library. The Columbus Memorial Library periodically mounts exhibits highlighting the history of the OAS and its predecessors, the OAS buildings, or the life and culture of the member state countries. Usually the exhibits are mounted in display cases outside the Simon Bolivar Room, on the Marcus Garvey Hall of Culture (behind the Patio in the Main Building), in the Library, and in the corridor outside the Columbus Memorial Library (ADM). In 1994, under the leadership of the then Permanent Representative of Uruguay to the OAS, Ambassador Dr. Julio César Jaureguy, the Group of Friends of the Library was formally established. The role of the Group is to assist the Columbus Memorial Library in realizing some of the planned activities and in generating renewed enthusiasm for its programs and activities. 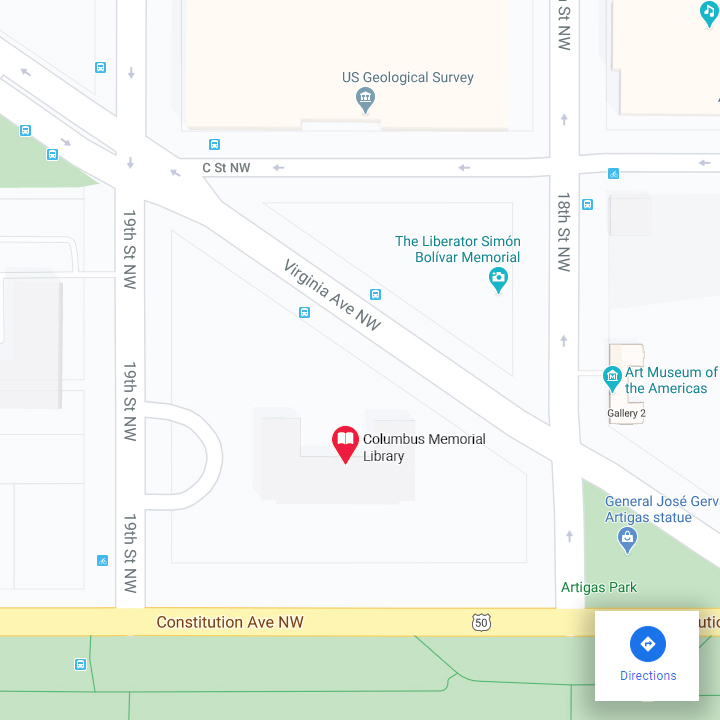 The Columbus Memorial Library is located at 19th Street & Constitution Ave. NW, Washington D.C. The building entrance is on Constitution Ave. You have to show a valid ID to receive your pass and proceed to the Library located on the ground floor. The Library is closest to the Foggy Bottom/GWU and Farragut West Metro stops. 19th Street & Constitution Ave. NW, Washington D.C.